The Support Services Division apply for, implement, and manage all local, state, and federal grants. They develop, implement, and manage the Police Department’s budget, training, background investigations, internal affairs investigations, and community events. If you were a victim of a crime or were involved in a traffic accident in the City of San Fernando you may obtain a copy of the report in person or by mail. The San Fernando Police Department offers Live Scan fingerprinting on a walk-in basis. By appointment only, call to schedule your appointment today! The San Fernando Police Department offers vehicle inspections for equipment violations. 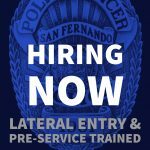 The San Fernando Police Department offers a Court Commitment Program for males only, convicted of non-violent misdemeanor offenses, who are allowed by the court to serve their sentences in a local jail. The San Fernando Police Department founded Law Enforcement Explorer Post 521 over thirty years ago. Our Explorer Program endeavors to teach young people the importance of personal responsibility, while developing their leadership abilities. The Explorer Program offers young people a variety of hands-on, career-oriented activities that provide the Explorers with a unique insight in the workings of the Police Department, while also providing service to the community. For young men and women who are interested in a career in the field of law enforcement, exploring offers experimental learning combined with lots of fun-filled, hands-on activities that promote personal growth and development. Visit the Forms section below for a current application. The San Fernando Police Advisory Council is made up of local, concerned citizens from businesses and the community at-large who are dedicated to promoting the goals of the San Fernando Police Department and to assist in programs that will benefit the community.